Yet, Americans are also divided on a fundamental question about how books should be treated at libraries: 24% support the idea of moving books and stacks in order to make way for more community- and tech-oriented spaces, while 31% say libraries should not move the books to create such spaces. About four-in-ten think libraries should maybe consider doing so. A Pew Research Center telephone survey of 1,601 Americans ages 16 and older conducted from March 7 to April 4, 2016, finds that Americans continue to express largely positive views about the current state of their local public libraries. For instance, around three-quarters (77%) say that public libraries provide them with the resources they need. And 66% say the closing of their local public library would have a major impact on their community ­ although notably, just 33% say this would have a major impact on them personally or on their family. A majority of Americans feel libraries are doing a good job of providing a safe place for people to hang out or spend time (69% feel libraries contribute “a lot” to their communities in this regard) as well as opening up educational opportunities for people of all ages (58%). And roughly half think their libraries contribute “a lot” to their communities in terms of helping spark creativity among young people (49%) and providing a trusted place for people to learn about new technologies (47%). As in past Pew Research Center surveys of library use, the April 2016 survey also measured Americans’ usage of and engagement with libraries. Overall, 53% of Americans age 16 or older have had some interaction with a public library in the past year – either through an in-person visit, using a library website, or via a mobile app. Some 48% of adults specifically visited a library or bookmobile in the past 12 months, a modest uptick from the 44% who said that in late 2015. There was a four-point drop, though, in the number who visited library websites in the previous 12 months – falling from 31% who said they’d done so in 2015 to 27% in 2016. Last year, Pew Research Center reported a growth in public support for libraries moving some books and stacks out of the public spaces in libraries and instead creating meeting areas or technology spaces. 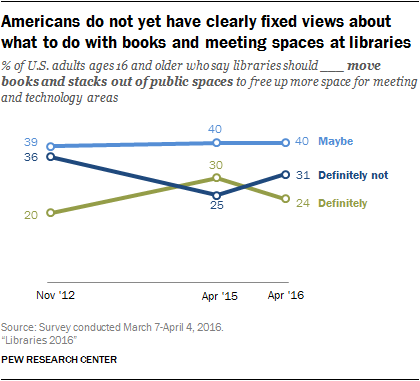 Nearly one-third (30%) in 2015 said libraries should definitely move books out of public spaces in favor of using that space for other purposes, an increase from 20% in 2014. However, the 2016 survey recorded another shift, as the number of people age 16 and older who said this fell six points to 24%. Correspondingly, the share saying libraries should definitely not move books increased in 2016 to 31%, up from 25% last year. The one figure that did not change, which reflects the tentativeness people may bring to thinking about this issue, is the share of people who say libraries maybe should move books and stacks from public places. A plurality (40%) said this in 2016, the same share who has said this since 2012. 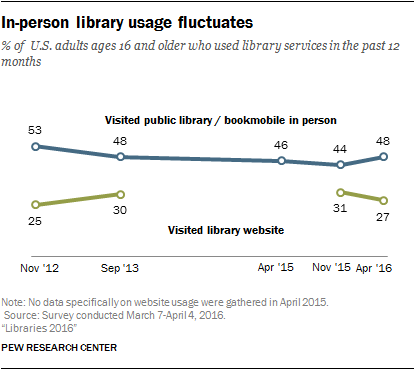 Young adults are more likely to have visited a library in the past 12 months than those ages 65 and older: 53% of those ages 18 to 29 visited a library or bookmobile in person in the past year, compared with 40% of those 65 and older. 19% of American adults say they have never visited a public library, including 11% of those who have college or graduate degrees. This report profiles those who say they have never in their lives been to public libraries. The act of borrowing printed books is still by far the most popular activity at libraries, even compared with using computers: 64% of library users ages 16 and older checked out a book in the last 12 months, compared with 29% who used a computer at the library in the same time frame. An emerging library “service” is its Wi-Fi connection, which can be used separately from the hours library buildings are open: 7% of those 16 and older say they have connected to a library’s Wi-Fi system when the library building itself was closed. 44% of those 16 and older say their public libraries loan out e-books, while 10% say this is not true of their communities’ libraries. Researchers at the University of Maryland report that 90% of libraries have e-book lending programs. So, many of Americans are not aware of this core service available at most local libraries. The idea that libraries serve communities at times of crisis is now pretty well established. Some 55% of those ages 16 and older say libraries contribute a lot (19%) or somewhat (37%) when a natural disaster or major problem strikes the community. There have been dramatic examples of libraries becoming refuges and outposts, for instance after Hurricane Sandy in the Northeast in 2013. The idea of “outreach librarian” is taking hold: 7% of those 16 and older have been visited in some way by a librarian in the past 12 months and another 4% have had that experience, but not in the past year.